Red Balloon Bookshop has been helping children, teens, and adults in the Twin Cities connect with great books and great authors for more than 30 years! Located on historic Grand Avenue in Saint Paul, Red Balloon is an independent, woman-owned children’s bookstore with a wide selection of books, toys, and gifts for all ages, from infants to adults. The bookstore is a great place to meet other readers and book-lovers, attend weekly storytimes, hear from bestselling visiting authors and illustrators, and find the perfect gift for a kid you know (or for yourself)! Red Balloon opened in 1984, just four doors down from its current location. By 1989, the bookstore needed more space and it’s been in the grey house with the bears out front ever since. Holly Weinkauf has owned the store since 2011, when the original owners, Carol Erdahl and Michele Cromer-Poire, retired. 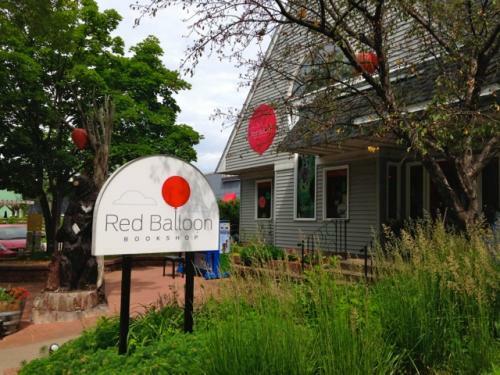 Named after the story by Albert Lamorisse, Red Balloon Bookshop continues to be an imaginative and exciting place for kids and kids-at-heart. Come visit us! Because of our love of reading and fun, Red Balloon Bookshop is dedicated to serving our community with books, gifts and events that inspire, inform and entertain, helping children of all ages—and adults!—live imaginative and rich lives. Jaya recently joined the Red Balloon after moving to the Twin Cities from Florida. An avid reader since childhood, she has always loved books and can often be found with a book in hand, or very close by. Jaya has been working in bookstores since 2005, and enjoys hosting story-time, birthday parties, and other events. When not working at Red Balloon, she can be found painting, writing her novels, reading the latest YA fantasy, and going to concerts with her husband, Jeff. A couple of her favorite books growing up were Ella Enchanted by Gail Carson Levine and The Enchanted Forest Chronicles by Minnesotan author Patricia C. Wrede. Barb has called the Red Balloon her home since 1997. Before that, she worked in several bookstores in her native Fargo, ND. She can’t remember when she didn’t love books and reading, and kept D'Aulaire's Book of Greek Myths checked out from the school library for the whole of her 4th grade year. She particularly loves children’s books (all types), food literature, travel essays, mysteries, and anything about the Tudors, but she can safely say she has (almost) never met a book she didn’t like. Susan has been with Red Balloon since 1992. She has a BA in Theology but her work life has been devoted to print: book publishing, two magazines, and now bookselling. Her favorite books growing up were Make Way for Ducklings, Christopher Columbus by the D’Aulaires, and the Little House Series. She loves customer contact, whether at the counter or in the process of handling school orders. In the third grade, Cindy was asked to do a creative book report and discovered that reliving books by acting them out was the best way to share her passion of reading. She spent 11 years working part-time at BookPeople in Austin, TX and loves the relaxed atmosphere and awesome co-workers that come with working at an independent bookstore. When she is not at a bookstore or library, you can find her running, biking, cooking, gardening, working at the German Immersion School, or playing with her three kids. Resident troglodyte/receiver since 1989, enjoying Christmas everyday as he unboxes new ideas (i.e. books and toys) to help wee ones fight ennui. And other stuff. Stacy has been a bookseller at Red Balloon since 2016. There are many great reasons to work at an indie bookshop, but one of the coolest things about her job is the chance to meet all of the amazing authors and illustrators. Her favorite genre to read is contemporary young adult fiction. When she isn't working, Stacy is reading, writing, painting, or exploring. Kelsie has been obsessed with books for as long as she can remember. After working at a bookstore in Woodbury for two years, she moved to St. Paul and now happily shares an apartment with her very own grumpy cat, Pickle. She is a student in the Twin Cities, and divides her time between selling books, reading, and school. The best parts of her job are making displays, working events, and sharing her favorite books with customers. Julie has been with Red Balloon since 1989. She raised her kids on the books she loves to sell. Now that they are out of college, she has stayed among the young adult books, especially sci/fi and fantasy. If your school has a book fair with Red Balloon, Julie will pick out the books. That and buying toys for the store are her two favorite parts of her job. She leads the Not-So Young Adult Book Club. Julie is also a Certified Wine Professional. Dawn has been with Red Balloon for almost 17 years. She is also a first grade teacher at Faithful Shepherd Catholic School. Working here helps her to find so many wonderful books to read to her students, and they love them all. Dawn’s favorite part of her job is finding just the right book for that special customer, and organizing the board book section. When she isn’t working she loves to cook new recipes, spend time with friends, read, and drink coffee. Joan has been part of the Red Balloon staff since 2004. Before coming here, she worked at Hungry Mind/Ruminator Books for four and a half years, and at B. Dalton for nine years. She is a writer (she has an MFA from Hamline Univeristy) and a grammar nerd, and is obsessed with Doctor Who, Trampled by Turtles, and her five grandchildren. But if you come into the store to chat, she’ll talk with you about her most enduring obsession—books. Lily has been at Red Balloon since the fall of 2015. She has an MFAC from Hamline University and is working on writing her very own books. Lily's favorite part of her job is talking to kiddos about the books they love most (and handing out balloons!). Her least favorite part is having to remember how the alphabet works. Lily lives in Saint Paul with her extremely fluffy and extremely demanding cat, Fiddlesticks (named after a character in Patricia Wrede's Enchanted Forest Chronicles). Her favorite books are usually magical middle grade adventure stories and #ownvoices queer YA. Holly has always loved books and working with kids and families, so in many ways this is her dream job. She knows books and stories add much to all of our lives. At Red Balloon she combines her passion for kids and books with a commitment to small business and community. Holly has a Masters Degree in Library Science from UCLA. She has worked as a children’s librarian, an elementary school teacher, and a childbirth instructor. When not at Red Balloon or reading, Holly is listening to music, sweating at a hot yoga class, and spending time with her family and friends. She lives in St. Paul with her husband, Don, and 3 teenage children, Madeline, Eli, and Roan. Angela joined the good ship Red Balloon in the fall of 2014, and assumed the job of Fairy Godmother of Events in 2015. She studied creative writing at Macalester College and has been loudly supervising kids and teens for almost two decades. She loves getting to know fans and authors at events; dramatic readings of picture books (and dust jacket copy); all the great books about princesses, witches, unicorns, creepy trees, and/or spaceships; and hanging out with the singing animal puppets that come to storytime. Angela lives in South Minneapolis with her husband, Chris, and their menagerie: Charlie Cat, Scout Fincheater, Tess of the Baskervilles, and Shepherd Book (the dog).